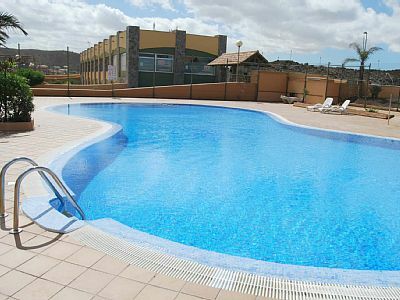 Villa Brisas is a three bedroom apartment which is located on the Brisas complex in Corralejo, Fuerteventura. It is only 10 minutes from the centre of the resort and the best beaches. The villa can sleep up to 8 people, as there is a sofa bed in the lounge. There is also wifi internet access and satellite TV which includes English channels. The kitchen is very well equipped and includes a washing machine and a dishwasher. There is also a full oven, microwave, tall fridge/freezer, coffee maker, toaster, kettle etc. The master bedroom has a double bed and the other two bedrooms have twin beds. There are 2 bathrooms, one with a bath and the other with shower cubicle.